We can’t control a great deal of what happens in our lives. What we can have a lot of control over is how we respond to those things happening around us. Wishing and hoping won’t get the job done. We need tools. Happily, wonderful and proven tools are available. 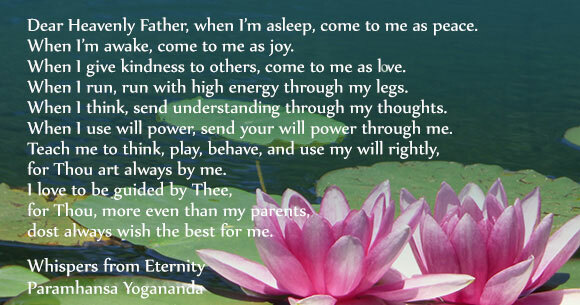 The teachings of Paramhansa Yogananda as shared by Swami Kriyananda provide just these tools. The teachers at The Expanding Light are living these practices and know how to share them with our guests. Is it time for you to visit or visit again? The upcoming programs listed below are geared toward helping you take more control of your life and live a more joy-filled life. Are you often caught by negative thoughts? Once they grab you, it can be hard to shake them loose. Recognizing when our own thoughts have turned south is the time to turn them around. Breathe, raise your energy, focus between the eyebrows. Decide to live in positive energy and send blessings instead. Do that enough times and you’ll find far fewer negative thoughts pulling you down. Joy is ours to claim. Tools work only when we use them. Pick up a tool and use it. Your life will improve. That will make you want to pick up another tool. Join us this summer and add some new powerful spiritual tools to work with to improve your life – here is a sample of 3 programs. More than 17 programs in July & August – plus Personal Retreat. Come and join with hundreds of people from around the world in a week of joyful learning and practice of the teachings of Paramhansa Yogananda. How to Avoid 10 years in therapy! Every year we joyfully welcome hundreds of first time guests to the Expanding Light Retreat. We’ve crafted a number of programs that are especially supportive and expansive for first time guests. "I wanted to thank you again for a wonderful and insightful week at The Expanding Light. I really enjoyed being in your presence, and I'm grateful for the tools you've shared with me. I feel like I've finally caught a glimpse of the light inside of me—a light I've been chasing all of my life. As long as I can remember, I've sensed there was something very special and powerful inside of me, but I didn't know how to reach it. You have all truly blessed me with a deep and spiritual awakening. Ananda is a very special place, and I hope I can hold onto as much of it as possible." Choose what dates work for you, and stay as long as you would like. Our inspiration videos were created to help change the world! Please Like and Share Our YouTube Channel - Thanks!